Why was a European base so important? The advantage for us is across the board including for our fleet channel and other customers. A lot of our customers put great faith in us and that’s based on our product of course, but supplying that from the other side of the world can be a difficult thing to do. Our office is more than that, it’s actually able to manufacture and do final assembly to lower lead times for our customers and we’ve a spare parts store there, so that lowers our time to react to faults. That’s valuable for our customers. Also it gives us more expertise on the ground, like support engineers, who give us 24/7 coverage across three different time zones. We can also undergo compatibility testing with new vehicles introduced in Europe there. What is Tritium’s USP in Europe? Our USP in Europe is the same as that in the US. We still spend time thinking about what an owner of the charging station would really want to see and what the user would want to see approaching the charging station, and the user conditions we’re interested in. We designed the charger back in 2012 and I think we were quite forward-thinking in understanding what the use case would be. We realised early on that these things don’t need to be tied to a location; they can be anywhere. But they needed to be installed, self-contained and intuitive to use and not need a large instruction manual on how to operate it. So we’ve paid a lot of attention to those details, but it’s taken the market a little while to appreciate those things we’ve added to the product. We’re still the only product that’s liquid cooled and that’s enabled us to cope with cold weather and be successful in the Scandinavian market – so there’s lots of those kinds of details that become apparent as the market gets more sophisticated. How will Tritium manifest itself in Europe? Tritium is a designer and manufacturer, not a network operator, so we provide our services and products to charge point operators. So if, for example, Fastned want to do a compatibility test then we’re quite happy to offer that facility. We have a 350kW offering, so we are offering that to charge point operators. Obviously that’s not going to come out over the next few weeks, but that’s a very exciting product for us. 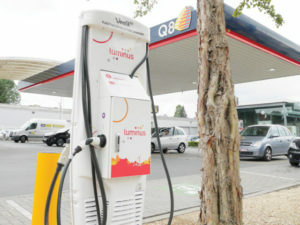 We’ve always had the vision that 50kW is great around town, but once you head up into that 350kW range, you do the numbers and see that suddenly the product has mass-market appeal and can be a replacement for petrol in terms of how you use your vehicle; drive across Europe, drive 1,000km, and fill up twice. That’s not really changing your behaviour or how you use your vehicle – it gives you the same freedom. How will rapid charging affect fleets? It also opens up some other interesting options, such as how the vehicles are offered in the market place. It’s a hard sell for a fleet sales person to go out there and say we like the whole idea of an EV but we now have to do infrastructure too. That’s actually not the same person you’re selling to and it has made the whole process so complicated now. Manufacturers were just selling to fleet operators but now it’s the case they need to talk to facilities people as well – so it makes them sound very complicated and it may not even be their building that they’re wanting to put infrastructure into. So with 350kW or even 150kW, we’re getting to the point where the fleet operator can make their initial assessment and continue using their fuel card or whatever they’re using at the petrol station around the corner.